Immunogen :The antibody was produced against synthesized peptide corresponding to amino acids 6-23 of Human CaM Kinase II protein. 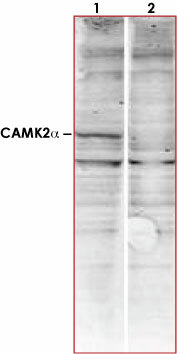 Sample Data :Western blot using Anti-CAMK2 (1:1,500) shows detection of a band ~54 kDa corresponding to human alpha CaM Kinase II Specific reactivity with this band is blocked when the antibody is pre-incubated with the immunizing peptide (lane 2). Scientific Background :CaM Kinase II (also known as CAMK2 and calcium/calmodulin-dependent protein kinase type II alpha chain) is a prominent kinase in the central nervous system that may function in the long-term potentiation of neurotransmitter release. CaM Kinase II autophosphorylates itself at Thr-286 which allows the kinase to switch from a calmodulin-dependent to a calmodulin-independent state. CaM Kinase II is composed of four different chains: alpha, beta, gamma, and delta. The different isoforms assemble into homo- or heteromultimeric holoenzymes composed of 8 to 12 subunits. This kinase is expressed in brain tissue. Alternative splicing occurs for this gene product. 1. Lin,C.R., et al. : Molecular cloning of a brain-specific calcium/calmodulin-dependent protein kinase. Proc. Natl. Acad. Sci. U.S.A. 1987: 84 (16); 5962-5966. 2. Bulleit,R.F., et al. : Conserved and variable regions in the subunits of brain type II Ca2+/calmodulin-dependent protein kinase. Neuron 1. 1988: (1); 63-72. Hanley,R.M., et al. : Functional analysis of a complementary DNA for the 50-kilodalton subunit of calmodulin kinase II. Science.1987: 237 (4812); 293-297.